MEETING DATES: EVERY THIRD WEDNESDAY. IFoster can save foster families thousands of dollars on every day needs. Low cost computers, improve diets, anything a parent can think of.. Please go to www.iFoster.org for more information. Right now, more than 400,000 children are in foster care in the U.S.
During May, we can all work together to raise awareness about these children and youth and the best ways to support them and their families. In April, the U.S House of representatives ways and means committee voted to eliminate the social services block grant, a major source of funding for child abuse prevention, protective services, foster care and adoption. Please contact your local congress rep. to stop this from happening....! 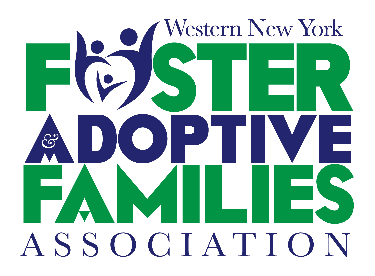 Adoptive Foster Family Coalition New York www.AFFCNY.org. Foster Care/ Claiming Children in care - Though the IRS clearly allows foster Parents to claim the children in their care on federal taxes, many are inadvertently prevented from doing so if they don't have access to the children social security number. AFFCNY is engaged in active advocacy on this contradiction in federal regulation and working with federal officials to resolve this issue. Adoption Support - In this section you find information about adoption subsidy eligibility and regulations; tax benefits for adoptive families; and grants, loan and employer programs to assist with funding adoption related expenses. For more information, please visit the website www.AFFCNY.org.